Students - Whenever these last days of school come around, I find myself thinking about changes. How have my children grown and changed? How have students I know grown and changed? How have I grown and changed? 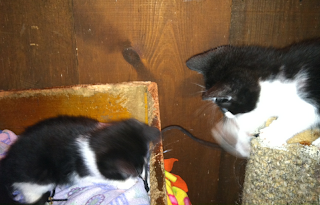 Because we have kittens in the house right now, I am also watching them change day-by-day. All of this rolled together into today's poem. You will notice that "Big Cat" begins with the speaker comparing him/herself to a kitten. I wanted to keep this same comparison through my whole poem, and you can see this in stanza two, especially in the verbs playing, pouncing, and pawing. In the third stanza, the speaker is a grown up cat...a year has gone by. It's neat to do this, keep one comparison throughout a poem. Pay attention to your writing - if you discover that you have a strong metaphor in one line, ask yourself, "Hmmm....might I carry this through more than one stanza?" Today I am thrilled to welcome kindergarten teacher Betsy Hubbard and her students from Fern Persons Elementary School in Olivet, Michigan, on one of their very last days of school. It is a treat to host a writing party for them here at The Poem Farm! This school year has been a huge one in terms of my growth as a teacher. I have stepped out of many boxes this year and almost everything I did here with students was a first for me and a great experience. My kindergarten students love reading and listening to poetry all year long. 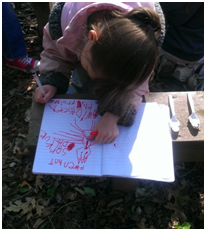 However, in April they enjoyed new adventures in poetry; writing their own! To find inspiration, the students first explored walking trails, creatures under logs and leaves, and a floral garden. With their writer's notebooks students made lists of observations, listened to quiet sounds and drew pictures of what they saw. 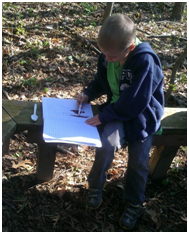 Each student wrote poems about their outdoor adventures and drew matching illustrations with everything from watercolors to chalk. We explored all kinds of poetry written by all kinds of poets, and we even listened to several poems from Amy here at the Poem Farm and peeked into other classroom poetry journeys. 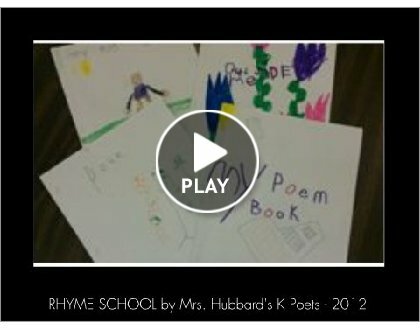 From all this exposure, students began to learn about what makes poetry so interesting. VARIETY! Onomatopoeia, rhyme, and alliteration make poems appealing to the ear, while free verse can have a sound and meaning all its own. My kindergarten students learned from each other and shared their poetry with classmates, teachers, and third grade buddies who commented on their hard work. 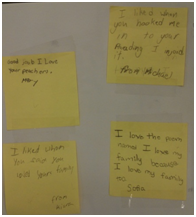 Each student made a book of poems to treasure, and we taped comments to the back. This positive feedback was both a motivator and confidence builder. Students then had the task of choosing a favorite poem from their personal collection, and we created a classroom poetry anthology to collect all of their poetic memories! I gave each of my students their personal copies of the anthology yesterday and told them they were each published authors. One young poet came up to me and said, "My mom is going to be so proud of me!" I send many many thanks to teacher Betsy and all of her poet students for joining us today and for sharing their warm words and joy-filled illustrations. Congratulations, poets, on your class poetry anthology! I know that you will keep this book, Mrs. Hubbard, and each other in your hearts forever. 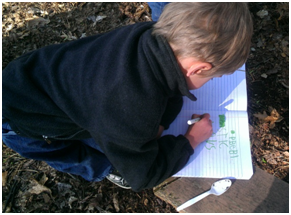 For more inspiration, you can follow Betsy Hubbard's blog at Teaching Young Writers. Hi Amy, & nice to see you, Betsy, in another place! Your students obviously love poetry. What a gift you've given to them this year. I love the slide show, with their beautiful words and drawings. "I love the house when the lights are low" stuck with me. Like many, lots of insight in these. 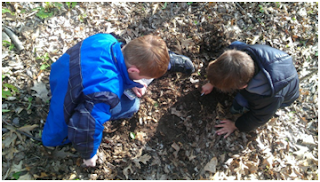 And loved your photos showing the explorations. Amy, it's a poignant time for teachers when they look at their students to say goodbye & see such growth, as now a Big Cat! Fun way to say it. Teachers want to hold on just a little while longer in these final days. Thank you both! I love the pouncing and pawing images of your poem, Amy, and the transition from kitten to big cat. I also loved the delightful poems by the students! I wish my son had had an experience like that in Kindergarten this past year ~ I know he would have loved it. Kudos to Ms. Hubbard ~ you sound like a very special teacher! Wonderful, wonderful, from whiskers to tail! Betsy has given a such a gift to her students -- I am always amazed at the insight shown by little ones. Heading over to her blog right away!